Home / Why should you choose ELEX WooCommerce Australia Post Shipping Plugin with Print Label and Tracking? Are you a WooCommerce store owner? Are you searching for a simple and efficient way to automate your shipping orders with Australia post? Our Australia Post Shipping Plugin helps you automate your shipping process. With this plugin, you can integrate Australia Post real-time rates with the WooCommerce shopping cart, automatically identify the best fitting boxes, track shipments from within WooCommerce and so much more. Australia Post is the trading name of the Australian Postal Corporation, an Australian government-owned corporation that provides postal services both locally and internationally, as well as operating retail outlets. Its headquarters is in Melbourne, Australia. It has over 4,429 metropolitan retail outlets; 2561 retail outlets in rural & remote areas. What is ELEX WooCommerce Australia Post Shipping Plugin with Print Label & Tracking? WooCommerce Australia Post Shipping Plugin with Print Label & Tracking is a WordPress/WooCommerce extension that helps you to automate Australia Post shipping by displaying shipping rates on cart/checkout page, track shipment from within the WooCommerce, pack items automatically into boxes, Print Label for contract customers and enable tracking. We usually overcharge or undercharge our customers for postage that’s because we do not have a proper measure of charging them. Our Australia Post plugin fetches exact real-time rates from Australia Post which solves the problem. On buying a product from the shop the real-time rates fetches easily depending on the location the rates come differently. Let us suppose if the shipping address is kept as Sydney then it shows the rates from shipper address to the shipping address which is Sydney here. If it is changed to Canberra the rates will be fetched from the Australia Post website and is modified in the cart page. The rates show up according to the product weight, box dimensions, shipping destination, etc.. This plugin fetches Australia Post postage rates for both domestic and international shipping services. You can choose from three different packing methods with Australia Post. This will, however, affect the rates. Per-Item: Each item in your cart (non-virtual) will be sent to the Australia Post API. Quotes for all items will then be combined with the final cost. Weight-Based: The cart will be split into 30kg packages, and each package will be sent to the API. No dimensions will be sent, only the weight. Pack into boxes: Items will be packed into pre-defined boxes and sent to the API. However, this is a recommended option. See box-packing below for more information on this. The plugin has a feature to restrict shipping to various countries. You can make use of the Method availability field to do this. In this, you have 2 options ‘support all countries’ and ‘support specific countries’. When you select the ‘support specific countries’ you get a field to add the specific countries, where you can include the countries where you need to ship to, thus restricting other countries. You can choose to display the cheapest rate or a range of rates which are applicable to the shipment. The different shipping options offer you different rates, so if someone wants to show only the cheapest rate among them they can enable this option. Set up handling fees based on the rules you define. Suppose, if you want to charge more for a particular product, You can easily set price adjustments for the products in the rates and services tab in the settings page. Get prices for the following domestic shipping services. Get prices for the following international shipping services. The premium parcel and letter service, International Courier is available at over 230 post offices. Estimated delivery by 1 to 2 business days between major metro areas. It includes Tracking also. For speed and tracking, you can rely on trust International Express. Estimated delivery by 2 to 4 business days between major metro areas. It includes shipment tracking and signature on delivery also. For tracked delivery and plenty of optional extras, choose our International Standard service. Estimated delivery within 6+ business days. It includes shipment tracking. With International Economy, Australia post finds you our most cost-effective route — by air or sea — and pass on the savings to your business. By air: estimated delivery by 10+ business days, By sea: estimated delivery by 30+ business days. If you have a contracted account you can subscribe to a specific service so that it will be the default service. Otherwise, you have to set services separately each time. Print shipping labels from within WooCommerce. After logging in to the WordPress admin area, you can create a shipment by clicking the ‘Create shipment’ button on the right-hand side of the order details page. Shipment details would automatically be sent to the Australia Post online account, and then the shipping label will be generated, which you can print. Postage is automatically paid on these labels using your Australia Post account. This plugin prints shipping labels with a tracking barcode. Live tracking number adds to the customer order details. Do you get hundreds of emails and phone calls from customers asking shipment tracking details? Now, give your customers a breather by attaching tracking information in order completion emails. The tracking number returned from Australia Post while generating the label would be added to order notes and will be sent as part of the order completion email. A visual representation of tracking status can be seen in Order edit page by Admin and in Order’s section of customer’s My-Account page. The tracking information shows the current status of the shipment in transit. So, there is clarity regarding the location of the shipment. Nervous phone calls and emails from customers asking tracking information are histories now. The plugin also allows you to define custom tracking messages. Enable/disable, edit the names of, and additional costs for services. Here, you can rename, and re-order, Australia Post shipping rates as well as add price adjustments as a percentage or by dollar amount. These adjustments can be either positive or negative, should you want to apply discounts on shipping. You can set Signature enabled services or allow the Registered options as well. If you set this option the item will be delivered only to the customer with his signature. The plugin also allows you to enable extra cover options at the service level. Suppose you are sending something which is very valuable or expensive, you have an option to add an extra cover. Items sent via ShopMate have no coverage for loss or damage. However, Extra Cover is available for items valued up to AUD5,000.00. It covers against loss, theft or damage to your parcel while shipping through Australia Post. To buy Extra Cover, simply select it as an additional feature when you pay for your item on ShopMate. It costs only AUD2.50 per AUD100.00 of your parcel’s value. Please note that the value of your item depends on the purchase price of the merchant’s invoice. This is a great plugin and the Support turn around time is fantastic for a new growing business where downtime seriously hinders your business, This is the place to get your plugin. If you are a shop owner there is no better time to start shipping with confidence by making informed decisions and providing transparency of shipments to customers. Get the latest version of our plugin and make your business better. WooCommerce Australia Post Shipping Plugin with Print Label & Tracking is one of the best plugin available in the market as of now in terms of cost, features, ease of use and support. 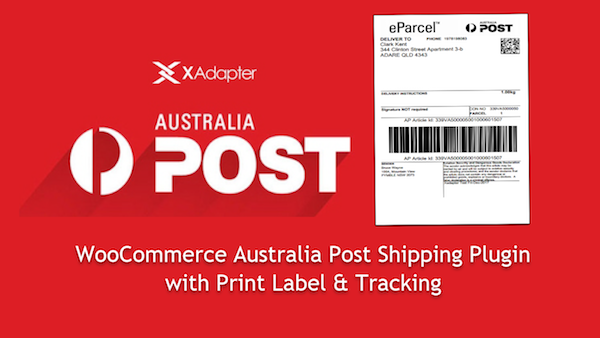 If you have any query regarding this article or WooCommerce Australia Post Shipping Plugin with Print Label & Tracking then feel free to share your views in the comment section below. We will be more than happy to help you understand how this plugin can work together in fulfilling your shipping requirements. Or in case you are wondering what more does the WooCommerce Australia Post Shipping Plugin with Print Label & Tracking serve, I would request you to kindly visit the official product page here. If you need assistance regarding our plugins, you can also contact our support team. We are always happy to help.